For a second there I thought she was still working on her foot. Dude, did she catch and eat another tiny dog? Yay Nunu! Raw Hide a Real Treat! What will I ever do once the Nunu advent calendar has come to an end? Bah Humbug! She looks so happy. 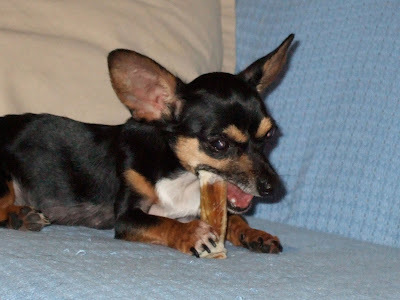 Be careful with rawhide, though, man, it can make her gums itchy. For a moment I thought she had eviscerated her foot! Are you sure that's you dog and not another rat? Just had to say that my kids and I love the Nunu advent calendar!! !What more can Nunu chew? We can't wait to see! you should go to pet smart or the other big pet store and get her one of those huge 2-3 foot long chew bones.. Your comment, "For a second there I thought she was still working on her foot" made me think of this video from America's Funniest Videos. ...which, in turn, made me think of this one. Don't know why. A new trick for Nunu? Is that a Bully Stick? My dog goes crazy for those, and they're the healthier alternative to raw hide!